The presidential candidate of the Peoples Democratic Party (PDP) in the 2019 elections, Alhaji Atiku Abubakar, has re-affirmed his commitment to restructuring if elected on February 16. 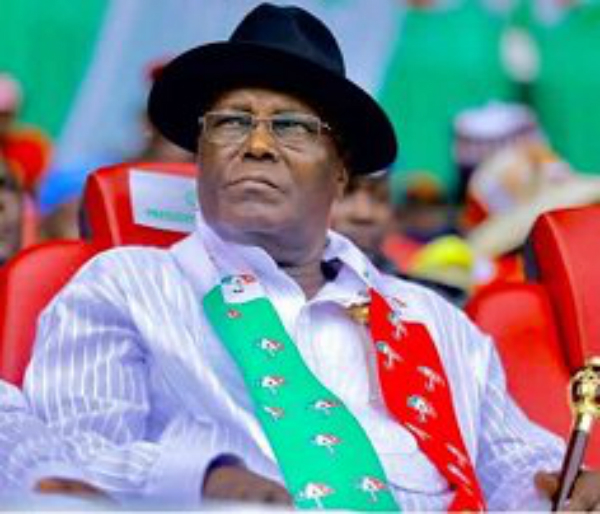 Hope For Nigeria reports that Atiku gave the assurance while addressing thousands of party faithful at a presidential rally at the Adokiye Amiesimaka stadium in Port Harcourt on Monday, February 11. The PDP presidential candidate who was accompanied by his running mate, Peter Obi, and other leaders of the party promised to uphold the rule of law. He said: “If you (masses) elect PDP and Atiku into office; I will restructure Niger Delta and all other parts of the country. We must restructure the country. Atiku said that his administration would complete the dredging of old Port Harcourt and Onne sea ports if he wins February 16 presidential polls. According to him, Rivers state, Niger Delta and south-south had been abandoned by the administration since 2015, notwithstanding being the economic hub of the country. “Every development that the people of south-south, Niger Delta and Rivers have gotten was done by PDP-led governments. The roads, schools, hospitals and water, among others were provided by PDP. “I assure you that I will protect the constitution, protect separation of powers and will not interfere with the National Assembly and Judiciary because I believe in checks and balances. “My administration will uphold rule of law and will never allow the rule of law to be trampled by anybody,” he promised. Also speaking, former president Goodluck Jonathan called on the people of the state to come out enmass to vote PDP at all levels. “If your son or daughter is qualified to become Inspector-General of Police and Chief of Army Staff, he or she will be appointed. No one will be discriminated. Atiku will lead Nigeria forward,” he said. Senate president and director general of Atiku presidential campaign, Bukola Saraki, said that Atiku had experience to take the country to greater heights. He said that poverty and unemployment had reached an all-time high never seen in the country since its independence in 1960. “There is poverty in the land and Nigerians are tired of poverty. The people want a man who can bring economic prosperity and that man is Atiku,” he said. On his part, PDP national chairman, Prince Uche Secondus, assured the people of victory at the polls. Highlight of the rally was the adoption of Governor Nyesom Wike as gubernatorial candidate by 58 political parties in the state. Meanwhile, Hope For Nigeria had previously reported that a northern youth group, Northern Youth Stakeholders Forum (NYSF), adopted Atiku as its preferred candidate for the forthcoming presidential election. The group made the affirmation on Saturday, February 9, during its northwest zonal town hall meeting, held at Mambayya House in Kano. The group say they are following the footsteps of the Northern Elders Forum (NEF) who earlier endorsed Atiku.